Spring and summer, tree pollen. Ragweed and grasses in summer and fall. I learned to fear them all. This, is the (not-so-poetic) story of my life. For 25 years, I was always battling something just to breathe. I had taken allergy medicine to keep me from falling apart from frequent allergy attacks ever since I was 2 years old. From 5 years old on, I took daily allergy meds, YEAR ROUND…(Dimetapp, Claritin, Zyrtec, Allegra, Flonase, Nasacort...I’ve had them all). My body got used to one drug, making it no longer effective. I then had to switch to the next, and the next, and so on. This USED to mean “sudden death” to my breathing abilities. It’s a glorious feeling to not be tied to drugs (drugs that only worked some of the time, anyways). Drugs that merely, temporarily, masked the deeper, more insidious problem inside my body…the inflammation. YES - I still am a little more “respiratorily sensitive” at the times my Weather Channel app looks like this, but I no longer need those meds to be comfortable. I can stay on top of the allergens instead of drowning in them. And furthermore, if you’ve read my blog in the past, I’m sure you’ve read how I have other beautifully natural ways of breathing clearly in the midst of seasonal sensitivities. :) Check those out too! There are 2 types of triggers: 1. Bad foods to avoid, and 2. Healthy foods we should be able to enjoy, that can possibly set us up for bad allergic reactions to the stuff that is naturally in the air. Removing these from my menu has provided SO much allergy relief! If anyone struggles with seasonal allergies, these four American staples are absolutely exacerbators in the struggle. Even if these items are non-GMO and organic (meaning, grown without herbicides/pesticides), they still can cause problems in our bodies. For an entire 2 years, I've been mostly off gluten and dairy and am astounded by the lack of stuffiness, itchiness, sneeziness, congestion and sinus infection-proneness I've experienced. Since age 2 I'd suffered bad allergies all year-round that made it hard to avoid respiratory illnesses like sinus infections. Never, since toddlerhood, have I breathed so freely as I do now! I'm not telling you to go "Paleo", but if you have allergies or get sick more often than you'd like, try staying away from gluten/corn/dairy/sugar during the seasons when allergens are high, or in those critical times (think, your wedding or finals) where you beg God to keep you from getting sick. Or, experiment on yourself a little if you don’t believe me. What could be more natural than popcorn with a movie? In all its Yellow #5 and Yellow #6 glory?? Last weekend my husband and I went to a movie. I grew up in a home where watching a movie without popcorn was practically immoral. Naturally, I did not hesitate to purchase the XL-free refill size though it cost more than my movie ticket. It had been months since I’d eaten popcorn, and I was a-hankerin’ to say the least. I had been watching the allergy reports, and though they’d been showing “HIGH” and “VERY HIGH”, I’d been doing my all-natural tricks, avoiding trigger foods, and had suffered no ill effects for quite some time. That is…until we stepped out of the movie theatre. NOTE: In allergy panels, I never tested as being allergic to corn or wheat…but with all we know about these genetically modified crops, it’s no wonder that I sometimes react to it when my body is under stress! Here’s the shocker…there are some GOOD healthy foods, that we SHOULD be able to eat, that HELP reduce inflammation…that can also become triggers. For SOME people whose bodies react to pollen, this really weird thing happens at certain times of the year. And it means that for some of you out there who sneeze like crazy in the early fall, a tiny compound in a cucumber can actually TRICK your body into thinking that it is a compound of ragweed pollen…and your body starts itching and sneezing when it hits your bloodstream as though you’d just swallowed a bunch of an allergen. Situation: No allergy attacks, nor symptoms for 5 days (since the popcorn incident), though the pollen has been high. 7pm: I take the photo above, then promptly eat the subjects. Some apple slices, a slice of watermelon, and then tossed the cucumbers into our dinner. In other words, I just dumped a TON of pollen-imitators into my body at once. 8pm: Nose/throat start itching, sinuses start clogging, and I sneeze a couple times. 11pm: Stuffy, itchy, and sneezing more. This morning: Woke up really stuffy and had to do several of my “all natural” solutions to clear it. Date: Just about every year for the past 2 decades. Though ragweed is everywhere, in the urban, suburban, and rural areas…the farm gatherings seemed to be my undoing. 11am: en route to destination: no symptoms. 1pm: Mingling with family indoors and outdoors: no symptoms. 2pm: Sneaking bites of “bad foods” and “good food triggers” as I help set the table. Itching begins. 3pm: Finish eating the big family meal, including the bounty of farm-fresh late summer crops of tomatoes, cucumbers, apples, peaches, and watermelon… Sneeze attacks and water works begin; general misery ensues. It wasn’t just a little dose of a trigger. It was a wholesale dumping of these confusing “cross-reactive” proteins into my poor system that was already a bit sensitive from all the ragweed in the air. I hear you. “No gluten? No dairy? No fruits or vegetables?? THEN WHAT THE HECK AM I SUPPOSED TO EAT? ?” Calm down…that’s not what I’m saying! NOT EVERYONE with allergies has these reactions with produce. And not everyone with reactions has them to EVERY cross-reactive fruit/vegetable. But if any of the above situations sound familiar, do an experiment on yourself. 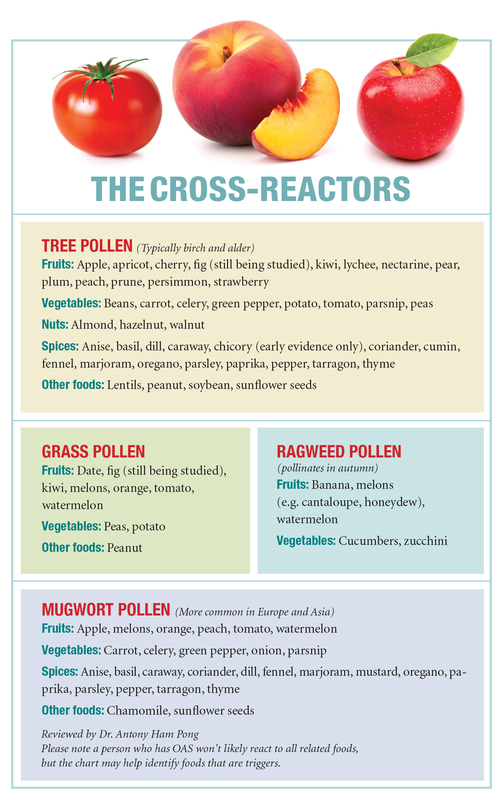 Hold off on eating the reactive produce when your allergies are bad and see what happens. If you sneeze in the spring, it’s probably tree pollen you’re allergic to. Apples, strawberries, and peaches might be cross-reactive for you that time of year. If it’s in the fall, it’s probably ragweed. 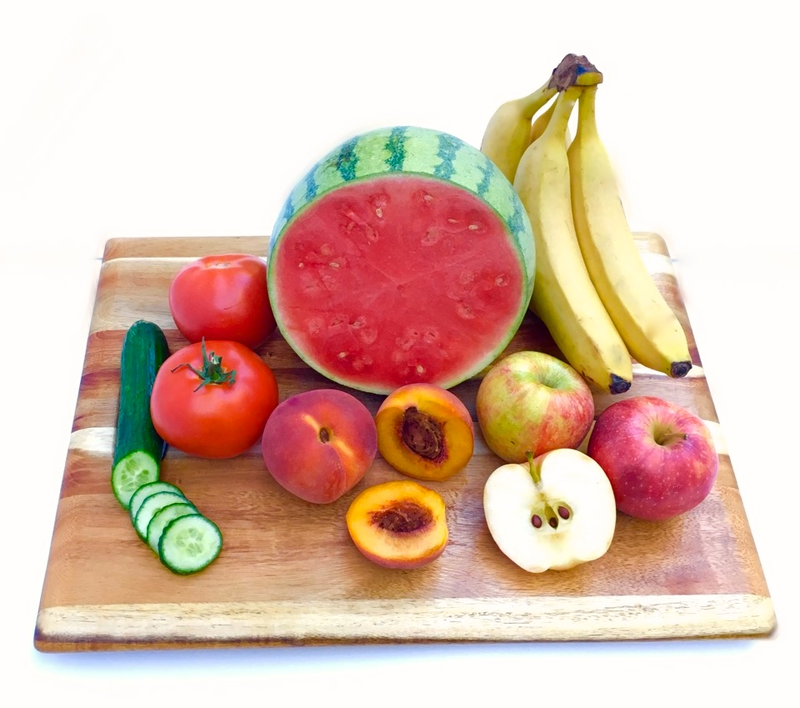 Cucumbers, watermelon, and bananas might be cross-reactive for you at that time of the year. Experiment on holding off for a few days, then re-introducing them one at a time to see if they’re an issue. Here’s one of the simplest charts I found while learning about this topic, from allergicliving.com (what a positive and encouraging domain name), and a page on their site with more information on how this stuff works. You’ve been so patient and diligent. Now let’s talk about a solution to this infernal, internal struggle. So…in addition to the all natural solutions I mention on this blog for seasonal sensitivities and soothing respiratory relief, let’s look at one that actually helps your body NOT react in the first place to the pollen granules (or to those confusing food proteins) as invaders. First off - stay away from the “BAD FOODS”! Those make you sensitive to anything and everything! That being said, taking a supplement that contains both quercetin and stinging nettles has helped me IMMENSELY! I take 2-3 capsules with meals when pollen is crazy high, if I’m eating something that I know gives me issues. When I stay away from the “Bad Foods” and the “Good Trigger Foods” I don’t really need these during allergy season. But if I’m eating something that causes issues, I take a few rounds with my meals and it helps SO much. Quercetin is a flavanoid found in fruits and vegetables. It is amazing for preventing inflammatory responses, and as such it’s great for auto-immune disease or issues like allergies where the body freaks out and attacks things it shouldn’t. It’s basically a natural anti-histamine and an anti-inflammatory. Stinging Nettle leaf has been used in the US for hundreds of years, both by pioneers and Native Americans, to help minimize allergic reactions and help with breathing. You can drink it in a tea, but it’s gonna take a bunch of cups a day to make a big difference. So why not take it in a capsule form? As with everything, you need to be sure you’re getting your supplement from a good source, and that it has no fillers so it’s as pure and as potent as it can be. This is a good brand. If you’re an allergy sufferer, I’m hoping that this little post will help you listen to and care for your body in a way that brings change and freedom you never thought possible! Here’s to breathing freely, the way we were created to breathe!